This retro-classic cake was made by my auntie last weekend. Doesn't it look gorgeous? She dressed up a recipe by the same name at Simplyrecipes.com. 1. In a saucepan over medium heat, combine 1/2 c butter and brown sugar and melt until sugar dissolves and mixture is bubbly. Pour into a 10 inch cake pan (at least 2 inches deep). 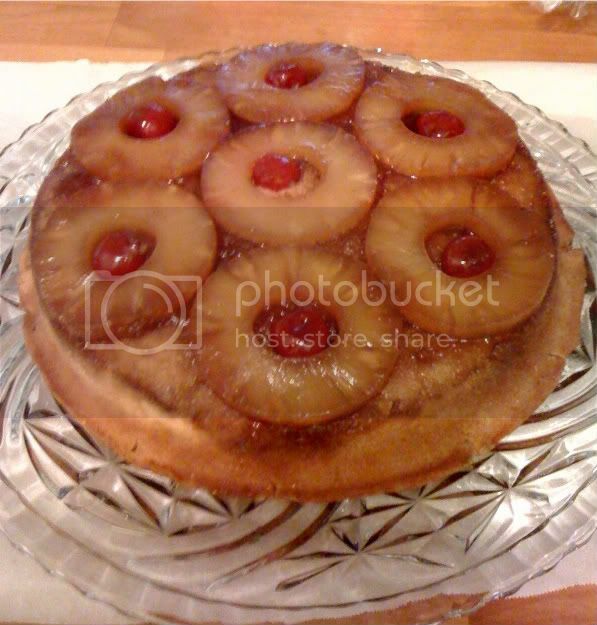 Arrange pineapple slices on top of the caramel and place a cherry in each ring. 2. Preheat oven to 325 degrees. Whisk dry ingredients (except for sugar) in a bowl, set aside. In a large mixing bowl, using electric mixer beat sugar and butter together until light. Add eggs one at a time. Add in vanilla. Add dry ingredients, alternating with sour cream, beating well after each addition. Pour cake batter over pineapples in pan. 3. Bake about 1 hour to 1 hour and 15 minutes or until cake tester comes out clean. Cook cake in pan on a rack for 10 minutes. Turn cake out onto platter. Serve warm or at room temperature.